The short answer is no, Load Testing does not shorten a battery’s life. The longer answer is that it also depends on how the battery is treated! Frequent charge/discharge cycles will accelerate the battery aging and performance degradation. Battery manufacturers don’t recommend excessive testing of their batteries per their Operation Manuals. It is unlikely that testing is needed more often than every 12 months to verify battery capacity. They do allow for a monthly “transfer test” to verify system load transfer if needed. Since Stationary Batteries are typically in float applications, cycle data isn’t often provided. A battery can handle a certain amount of cycles and that is dependent on the Depth of Discharge (DOD). The deeper the discharge, the less cycles a battery can handle. 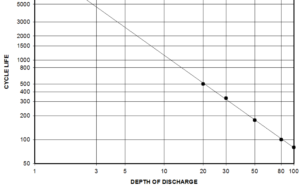 Example: See graph for standard C&D Technologies Vented Lead Acid discharging cycles. 100 cycles at 80% DOD, 190 cycles at 50% DOD, 500 cycles at 20% DOD, etc. If you perform Load Testing per IEEE it is likely that you are working under the “Performance Test” guidelines. The IEEE Performance Test requires testing within the first two years of a batteries life and then every 25% of its life after that until a battery shows signs of degradation or reaches 85% of its service life. Once a battery shows signs of degradation or reaches 85% of its services life the recommendation is to Load Test annually. Example: C&D VLA batteries have a 20-year service life. This would mean tests are likely to be performed at years 2, 7, 12, 17, 18, and 19. In a worst case scenario, if your VLA batteries were load tested 10 times to 80% DOD (1.75 volts per cell) in its life and the you average one outage per year at 80% DOD, that only equals out to 30 discharges of a VLA battery. Based on this chart, a C&D VLA battery can handle about 100 cycles at 80% DOD. Performing 10 Load Tests over its life and allowing for one outage per year doesn’t begin to scratch the surface of what these batteries can handle!